Buddha was very special to me and I will always love and miss him. Buddha, the brown and white neutered senior boy,was one of the early rescues we did when I started SaveABunny in 1999. I noticed a small, cute little bunny huddled in the back of his cage all the way at the bottom row of cages and decided to take him into rescue. As I later learned he was close to being euthanized. 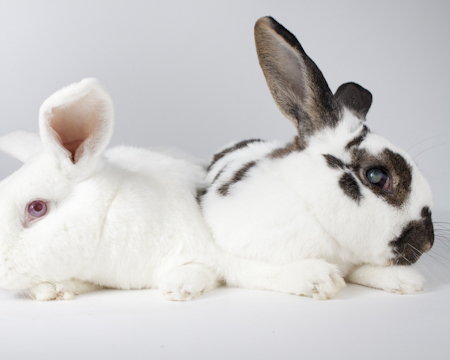 At that time SFACC had an almost 90% euthanasia rate for bunnies and we only took very few rabbits. Buddha was huddled in a pose that reminded me of someone meditating---that's how he got his name. But he turned out to be anything but mellow. He was fearless and perched on the edge of his litter box waiting to pounce! He taught me a huge amount of how to understand and work with bunnies. We were sure he'd lived many past lives as a bird of prey and was trying to figure out how to now live as a bunny! I learned the power of "napping" with a bunny and how healing that can be for both human and bunny. Over the years Buddha has now started to slow down and have cataracts. He is probably close to 12 years old. He has learned what it means to live life as a bunny and has been a very devoted mate to Sabra who passed away and he is now a very devoted spouse to Surya. Rarely are they more than several inches from each other. They snuggle and groom each other constantly! Surya was dumped back here after her mate died and she was very lonely. She really needed someone to dote on her and Buddha turned out to be the perfect match. He recently lost his beloved mate, Sabra. love and attention then they get here? !